Australia’s evangelical movement is small, yet its loud and well-funded voice has made huge waves in Australian politics, causing much harm to LGBTIQ Australians and much risk to LGBTIQ youth. 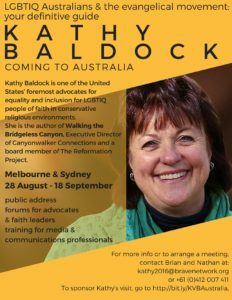 The Brave Network Melbourne, an advocacy and support group for LGBTIQ people of faith, is bringing one of the US’s foremost LGBTIQ faith advocates, Kathy Baldock, to Melbourne in August 2016. 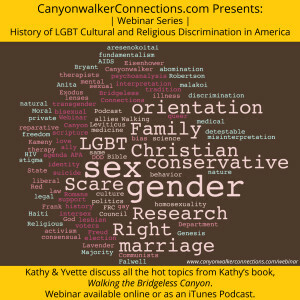 Kathy heads her own organisation Canyonwalker Connections and is a board member of The Reformation Project, one of the world’s largest networks for LGBTIQ Christians. 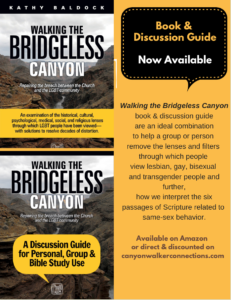 An experienced and entertaining communicator, accomplished entrepreneur and businesswoman, and trained engineer, Kathy is a regular speaker at LGBTIQ and evangelical conferences around the world and is renowned for her expertise in training diverse audiences about the psychological, historical, and theological aspects of the church’s engagement with LGBTIQ people over the past centuries. 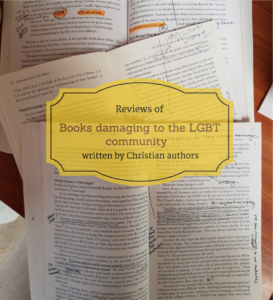 Her insights into the clash between evangelicalism and LGBTIQ inclusion provide vital context for any person wishing to successfully engage faith and sexuality in public conversation. Kathy will do public addresses, presentations in churches, train media, religious leaders and LGBTIQ advocates in how to effectively engage with the evangelical movement. 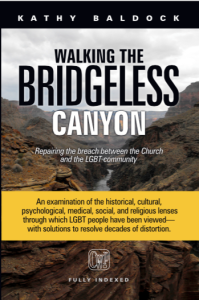 Kathy’s visit to Australia provides a groundbreaking opportunity for stimulating open and productive discussion between LGBTIQ Christians and allies and the established church. 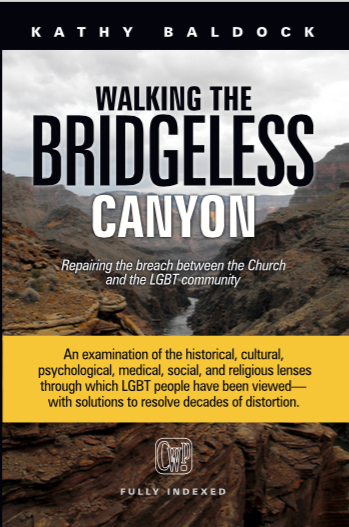 We have rarely had an LGBTIQ faith advocate of this calibre come to our shores. We invite you to make a difference by supporting this visit on this Australian fundraising site. 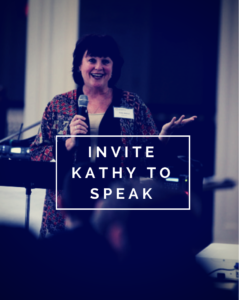 Brave Network Melbourne welcomes Kathy in conjunction with our hosting partner, Collins Street Baptist Church. 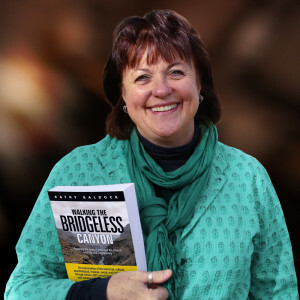 Following her time in Australia, Kathy is planning to travel to New Zealand for about 12 days to share in workshops and lectures. Colin Daley will be hosting Kathy in Wellington. Currently, the programme is flexible. Colin is talking with some local churches. If you wish to get involved and have ideas on how she may help in your church, then get in touch with Colin. There will be some limited opportunity to travel away from Wellington. Colin is in conversation with the Salvation Army in NZ to see if that organization can benefit from Kathy’s time in NZ. There is some interest, but please pray for us as we have some more discussions in the coming weeks, that her time in New Zealand and Australia may be productive and help make a difference in our churches. Funding for the entire trip will be raised on the same site. HERE.